Charity Challenges - Work Hard. Raise Money. Help People. Register Now! How Does This Work? Registration for the Spring Challenge 2019 is now open! Registration for the 1,000 Mile Challenge 2019 is now open! Charity Challenges will provide you with the tools, support, and community to give you the best opportunity to crush your challenge! People who have worked through our challenges have seen drastic results in the way they view themselves and their abilities. Many accomplished goals they never dreamed they could complete. Most improved their work capacity, maximum repetitions, and overall strength. Each event has a set duration so you will always know where you stand. At any point you can view how close you are to accomplishing your goal. Each challenge features set goals to work towards. These goals are scaled so that everyone from the least to most athletic will be challenged. Complete these goals and earn patches (both virtual and physical) to show off your accomplishments! By signing up for these challenges you are making a difference in the lives of our nation's veterans. 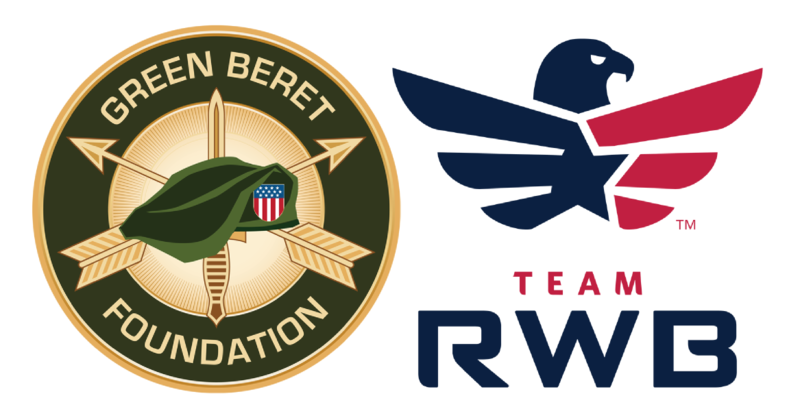 We are strong supporters of veterans and your registration support the Green Beret Foundation and Team RWB. We have had 12,326 event registrations to date. Through those efforts we have donated $115,088 to charity! Join them and register for an event today! I feel way stronger with my pull ups than I ever have! Awesome challenge and fundraiser! Thanks for an awesome challenge, thanks for the motivation I got from seeing everyone's awesome accomplishments, and most of all, thanks for pushing me out of my comfort zone! All the extra work into doing these really has made me stronger....Thanks for such a great event!!!!! Wrapped up my 2015 with CF hero wod "Clovis" . 10 mile run. 150 burpee pull ups. And wore 10# vest. Thanks again for this amazing challenge. The last 3 months have been soooo helpful, inspiring and motivating beyond words. I know I wouldn't have been able to do this wod before completing this challenge. Made my 2015. How does the logging work? The logging is done on the honor system. You do the activity then log in to this site and enter what you completed. You can make an entry for each item, each week, or each month... the system doesn't care. Only logged reps count toward your achievement tab so make sure they make it in the system! What happens if I sign up but don't meet the minimum achievement? If you do not meet the minimum tab level you still receive a digital badge, the Shield patch (if it was purchase din advance), access to the Facebook group, and the ability to buy additional swag we have available for participants only. Do I have to be on Facebook to participate? No! You can participate solely through the website. We recommend you do join the Facebook group as the group provides a huge amount of content, motivation, interaction, and value to those who participate but it's not required. How do I know you will actually donate the money? Our entire donation history is available on our Previous Challenges page. We care deeply about those who defend our freedoms and the freedoms of people around the world. Being deploying is difficult for families and veterans transitioning to civilian life often have a hard time finding their new role. Organizations that we donate to support veteran's families and those transitioning back. Register Today For Any of Our Open Events!